This is one of my favourite Web 2.0 sites: Useless Account. The best ideas are always the most simple. With Useless Account you sign up, you login … and that’s it! How many Web 2.0 online services have you signed up to, but have never returned to: have never discovered the full potential of its rounded corners and gradients? I spotted this on I Want One Of Those. It’s the Scotty Pro solar charger from German company Solarc. Pop this little solar charging beauty in direct sunlight for a few hours and it will charge up its rechargeable AA batteries enabling it to power up your mobile phone, games console, MP3 player, digital camera or any other USB-powered device, and it will run for up to 12 hours. Of course it’s not always sunny (sadly) but that doesn’t matter, because you can stick a couple of standard AAs into your Scotty Pro, and it’ll charge up your devices just the same. Come rain or shine, the Scotty Pro is an indispensable power provider for a multitude of appliances when you’re out and about. The Scotty comes with a mass of adaptors for mobiles, and a USB cable that will charge iPods, digital cameras, PDAs and any device with a USB port. Now you only need one charger when you’re on the move. I’ve got the Scotty … amateur, I guess. I got it a few years ago with just the Psion 5/5mx adapter. 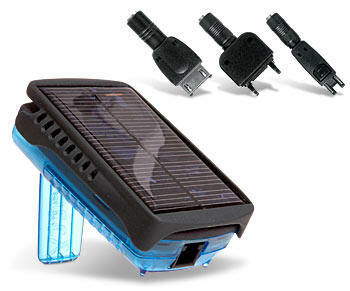 Certainly, the other adapters would be a cool addition to my basic solar unit. An alternative might be Powermonkey and Powermonkey explorer, which appears to be the solar version. Now, I have to admit that I don’t list Cannibal Corpse amongst my favourite bands, but this video is utter genius. WARNING: Don’t watch/listen to it if you are easily offended. Cannibal Corpse’s last album “Kill” has one of the most tame titles, or indeed covers, of any of their albums in their 17 year career. Who can forget their debut album “Eaten Back To Life” (1990), which was followed up with “Butchered at Birth” (1991) and “Tomb of the Mutilated” (1992). You’ve probably gathered already that you’ll never see them coaching any of the contestants on ITV’s X-Factor! Sure, I’m into my extreme metal, but I just don’t ‘get’ Cannibal Corpse. While the music’s great, the lyrics and artwork are all a bit too graphic and violent for my liking. Which is why I think this video from YouTube: Cannibal Corpse Lounge Music is absolute genius. By removing the lyrics from the original, violent and heavy music, and putting them to piano/double bass lounge music it highlights just how ridiculous it is that this band is constantly victimized by the authorities. It’s art, just look at it as art. Yeah, it’s disgusting … but go to the Vatican and look at some of the art there. That’s real, that’s representing something that’s real, that could happen. This [artwork], you know, that’s never going to happen … monsters aren’t going to rip out of people’s bodies anytime soon. Jane: What do you want to do tonight? Gareth: Erm … rock climbing! Jane just looked at me funny. Gareth: What do you want to do tonight? Jane: Dunno. What do you want to do? Gareth: Do you fancy a game of Computer Battleships? Jane: [laughing] NO! … is that what you want to do? I haven’t played Computer Battleships since I was about 15. It still works though. I test it every month. Posted on Saturday 3 November 2007 Thursday 14 December 2017 Categories GeneralLeave a comment on What do you want to do tonight? Here’s my prediction for 2008. This will be the next ‘big thing’ in daytime TV. It will be a TV programme where two presenters will help a family find their dream home in the country. Meanwhile the entire family will be given complete make-overs and where necessary plastic surgery. The team will also assist in the selling of the house from which they are moving, by suggesting interior decor tips to make the house more attractive to potential buyers. And sell the entire contents of their attic at an auction. Or car boot sale. Once the new ‘dream home’ has been purchased a team will come in to completely gut and renovate the house and garden. I predict that this programme will appeal most to those on witness protection schemes.